With so many stressors out there, it’s no wonder many of us fall into bad habits. Smoking, abusing substances, eating unhealthy foods, failing to exercise every day, and falling into unhealthy relationships are all examples, and these behaviors can affect both your physical and mental health. When a period of transition occurs — such as a move, leaving a job or a relationship, or seeking treatment for a substance abuse or mental health disorder — it’s the perfect opportunity for you to start forming good habits. Exchanging bad habits for good ones can have a major impact on your life. From boosting your self-confidence and esteem to helping you live a healthier lifestyle, there’s no limit to the things you can do once you get an idea of how to get started. The key is to begin slowly and map out a plan that will be easy for you to follow so that you can succeed and stay motivated. With the first success, you’ll be empowered to move on. Keep reading for some great tips on how to form good habits. If you’ve recently had a job change or a setback in your career, think of this as an opportunity to reduce stress. Our jobs are a major contributor to the way we handle stress and anxiety, so changing things up could be beneficial. Consider taking on a position with fewer responsibilities, or move from full to part-time and pick up a side gig that makes you happy. Cleaning and decluttering your home can help boost your mental health, so if you’re moving or have recently divorced or separated from your partner, think of this as a chance to streamline your life. Go through your belongings and decide which ones you want to keep, which ones can be sold or donated, and which ones you can put into storage to prevent them from taking up space in your new home. If you do opt for self-storage, keep in mind the overall average price of a storage unit booked in New York City over the past 180 days is $91.36. If you’ve recently found that your relationships are taking a toll on you, take some time out for yourself and focus on your needs. Negativity in our interactions with others can affect our self-worth and our ability to see value in others, but stepping back and making an effort to spend time making yourself happy can do the opposite. Practice self-care and learn to enjoy being alone by meditating or engaging in a healthy activity, such as yoga. Many people find that after a health scare (either for themselves or a loved one), they are inclined to take better care of themselves. Use this time to learn what the best-balanced diet is for your needs, how to work in exercise every day, and how to get good sleep each night. You might do some research online and consider the easiest way to begin new routines in these areas. All of these things can have a dramatic effect on your health, both now and in the future. It’s not always easy to make major healthy changes to your lifestyle, but with some careful planning and a positive attitude, you can turn your bad habits into good ones in no time. Talk to your friends and family members about your goals in order to have some accountability, and consider keeping a journal where you can write these goals down to stay motivated. Magnesium is the fourth most abundant mineral in the body. Found in bones, teeth, and red blood cells, magnesium serves as a building block for DNA and is an essential element required for proper functioning of the nervous, muscular, and cardiovascular systems. Electrolytes are minerals in your body that have an electric charge known as ions. Electrolytes are primarily composed of the minerals sodium, potassium, magnesium, calcium, chloride, phosphates, and sulfates. These minerals ensure electrical functions in the brain, the nerves, as well as muscle contractions. They also play an important part in blood pressure regulation and heart function. Electrolytes are electrically charged and they are essential for life. Well, sweating in warmer temperatures is an obvious cause. An additional cause of depletion is alcohol consumption which will drain the body of electrolytes, water and B vitamins. All are essential for daily function, mental sharpness, and improved sports performance. Other causes can include dietary restrictions, increased age, inadequate hydration, stress, medications such as diuretics or blood pressure medications, inadequate kidney function, increased urination, and digestive ailments. Deficiency can result from many causes including the extended use of proton-pump inhibitors, such as Nexium and Prilosec. All contribute to electrolyte deficiencies. It’s best to get nutrients, like magnesium, from food sources whenever possible, since they provide other health benefits, too. How much magnesium you need depends on your age and gender. But for men over 30, I recommend at least 400 mg/day. Because magnesium supplements can interact with some medications, it’s important to discuss the need for a dietary supplement with a healthcare provider before taking one. Modern farming techniques have caused a depletion of magnesium in the soil, and our reliance on highly processed food also means we get less. Water-softening technology has stripped drinking water of magnesium, contributing to our deficiency. Reductions in magnesium levels, or changes in the way that it is processed, have been linked to increased levels of anxiety. Magnesium is one of the nutrients in our bodies that support well-being by regulating the chemicals in our bodies that control our state of mind. In fact, research shows a link between low magnesium intake and depression. So what happens in the brain and body when we don’t get enough magnesium? “When you start to untangle the effects of magnesium in the nervous system, you touch upon nearly every single biological mechanism for depression,” says psychiatrist Emily Deans, MD, in Psychology Today. Magnesium is involved with our hormone balance and stress response, Deans explains. Chronic stress causes excess cortisol in the body, which damages the brain and can make the effects of stress even worse, leading to depression. Magnesium can help suppress the release of stress hormones like cortisol and acts as a barrier to prevent the entrance of stress hormones into the brain. It also protects receptors against an excess of calcium, which can damage the brain by over-activating neurons. Research has also shown that a low-magnesium diet may alter the types of bacteria present in the gut, and this may impact anxiety-based behavior. It’s estimated that nearly half of Americans are magnesium deficient. A magnesium deficiency is difficult to diagnose due to its wide distribution throughout the body and symptoms associated with other health conditions. But early signs of a deficiency might include everything from irritability and muscle weakness to an irregular heartbeat. Another common sign of a magnesium deficiency is cramping. Cramps can affect any muscle in the body but are most common in muscles or muscle groups that span two joints – e.g. the calf muscles of the lower leg (gastrocnemius) and the hamstring muscles of the rear thigh. Muscle cramps can last anywhere from a few seconds to minutes, and a muscle cramp in a particular location may also reoccur multiple times until it finally goes away. Cramping occurs when the normal mechanisms controlling muscle contraction and relaxation become temporarily impaired. Genetics are also known to play a role (some people are simply more prone to muscle cramping than others all other things being equal) as does age (muscles in the elderly are more prone to cramping than in younger people). However, most scientists agree that “true cramps” – those we normally associate with vigorous exercise, fatigue, and dehydration/electrolyte imbalances etc. – are caused by hyperexcitability of the nerves that stimulate the muscles, which also explains why much attention on preventing cramps has been focussed at minimizing this excitability through optimum nutrition and conditioning protocols. Some studies have shown that a 6% carbohydrate-electrolyte sports drink can help delay the onset of exercise-induced muscle cramps in endurance activities such as distance running, but not prevent them entirely. Moreover, magnesium supplementation has also been shown to help sufferers of “night cramps”, which involves nocturnal muscle cramping (normally in the legs). *In my personal experience I have had many clients over the age of 60 over the years who have complained to me about “night cramps” in their legs. I recommended a magnesium supplement of 400 mg/day, and in all cases, the cramps went away. If you drink a lot of water but run to the bathroom soon after, it means that your body is not absorbing the water. You are low on electrolytes and will be dehydrated at the cellular level, while also feeling thirsty during the day. One of the ways to solve this problem is to make sure you are drinking quality water from spring, glacial or artesian aquifers. These sources already have a naturally high mineral content. You can also put a pinch of natural sea salt in your water and just give it a shake. You won’t taste it and it will help add the necessary electrolytes to make it easier for your cells to absorb the water. Regardless of the reason, most of us are deficient in magnesium. After reading this article it should be clear that is an essential element responsible for proper muscle contraction, supporting the normal rhythm of blood pressure, nervous system function, maintaining bone density as well as mental health. It is also known to be involved in glucose and insulin metabolism. In fact, studies have shown that a diet rich in magnesium may help protect against metabolic syndrome. Scientists continue to discover the potential benefits of magnesium, ranging from helping to prevent migraines to treating anxiety, severe asthma, and ADHD. And while findings are preliminary, another study released the same month suggests that this key mineral could possibly slow the progression of Alzheimer’s disease. Magnificent Magnesium, make sure you’re getting enough. It’s hard to believe it’s nearly here.. 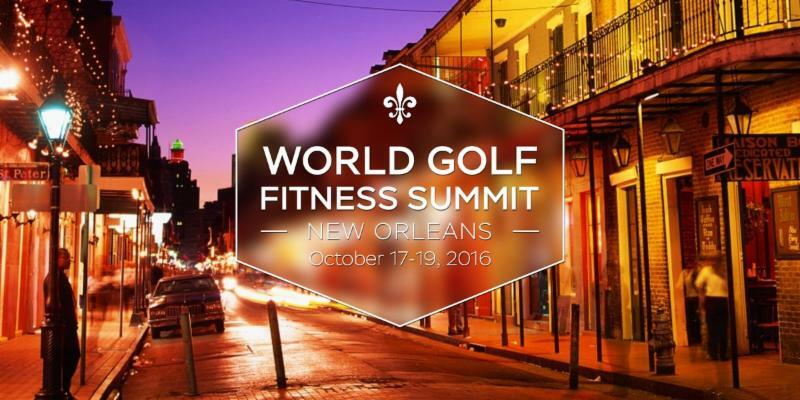 The 2018 World Golf Fitness Summit! On Thursday, October 11th I will be flying out to Orlando to meet up with my TPI family at my second WGFS.. It’s already been two years since I attended my first in New Orleans..
OMG-Where does the time go! The summit offers an opportunity to learn from 50 of the foremost leaders in golf and sports performance. Speakers will cover the topic of Yards and Years from all angles. The 2018 Summit speakers will include PGA TOUR swing coaches, renowned strength and conditioning coaches and the industry’s best health & medical practitioners who are working with the world’s best athletes every day. 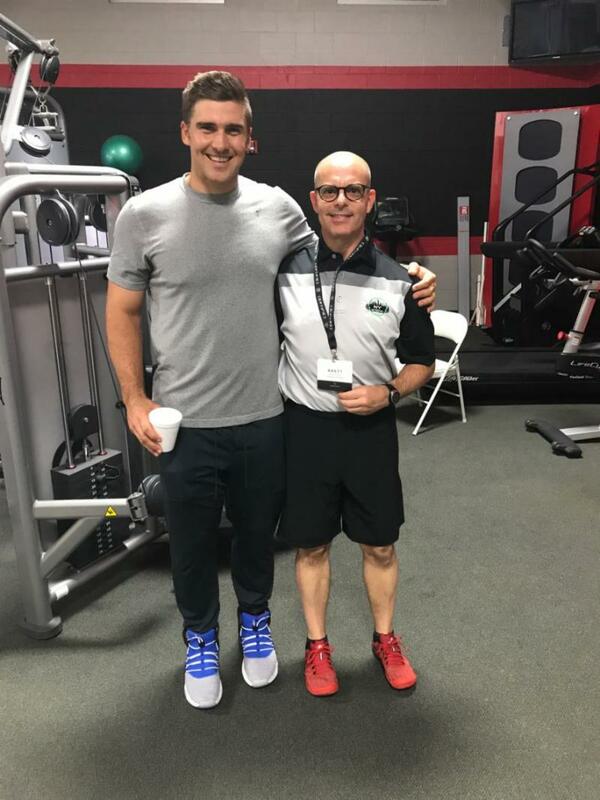 At the 2018 World Golf Fitness Summit not only will there be experts in golf to tell us how to hit the ball farther and play longer but there will also be experts from other sports including: baseball, tennis, basketball, so we will get insights on some tools and tricks that athletes of other sports are using and that we can steal and use them to help you play golf better. One of the featured speakers at this years event is my Fitness Level 3 colleague and World Long Drive Champion Justin James will be sharing the “secret” to longer drives, and what he did to take his ball speed from 180 mph to 220 mph. When it comes down to brass tacks it’s all about the science of building better athletes and then transferring that into the golf ball. The better the athlete the more potential that person has to play golf better! It is my intention to present at the 2020 World Golf Fitness Summit. The exact topic and subject matter to be determined by I have the next year and a half to prepare before submission. The competition is fierce. Over 200 submissions for 50 slots. But you’ve gotta be in it to win it! BodiTrak is a leading-edge sports technology company, focused on the interaction between an athlete and the ground. Their sensor technologies provide real-time data – a window into that ground interaction between the athlete and the ground – and their team of advisors work to make that information insightful. By utilizing technology like BodiTrak, we’re able identify movement that the naked eye cannot. Data offers more opportunity to evaluate technique and provide biofeedback for improvement . BodiTrak products give teachers, coaches and golfers the tools to visualize and better understand the golf swing, to make improvements faster and track success. The mat measures your interaction with the ground and everything you do with the club will be reflected in the ground and therefore, in the mat. So when the golfer can understand how they are interacting with the ground, then that information can be used to help the golfer improve their club delivery by using that feedback. Take a look at this video of PGA Professionals Piers Ward and Andy Proudman of Me and My Golf, along with my instructor from the Titleist Performance Institute, and BodiTrak instructor and tour coach, Mark Blackburn, use the BodiTrak technology to help Piers get more pressure into the trail leg in the backswing transition and then transfer that pressure into the led leg during the downswing transition in order to maximize compression with the golf ball. In this video, TPI instructor Lance Gill explains how he uses BodiTrak to perform the Overhead Deep Squat ​. A very informative test that is part of the Level 1 screening process, and how the results on the test can show us if that athlete is loading laterally or are they able to keep their center of pressure well balanced during the squat. Lance Gill describes how to enhance the overhead deep squat physical screen by looking at an athlete’s interaction with the ground. The BodiTrak force & pressure measurment systems are used by sports medicine and sports performance professionals like myself, around the world, to assess movement patterns, communicate trends, and validate care methods. Because BodiTrak quantifies vertical force, evaluating force can be a useful way to gauge progress month-by-month or even assess the effect of fatigue at the end of a workout. It also can be a useful tool for encouraging maximum output in a workout. Since athletes see an objective measure of how hard they are trying in a push up, they can’t slack . After all, intent is one of the most under-appreciated elements of an effective training session. BODITRAK provides valuable insight into how an athlete interacts with a ground. No matter how many of the above exercises you have seen, done, you are simply unable to determine their true ground mechanics without a pressure and force mat. BODITRAK assists and enhances assessments, training, and rehab, highlighting important information (such as an uneven pressure trace or force production) that will allow you to improve your game at a more efficient and effective rate. Enhanced coaching –> quicker athletic improvement. Athletic improvement –> playing golf better FASTER. Have you ever wondered what allows the pros hit the ball so far? Of course you have. I have never met a golfer that wouldn’t like more yardage. Longer drives gives you the potential for lower scores and isn’t that what golf is all about! The ability to create large vertical thrust is a must if you want to hit the ball a long way. When we look at PGA players we see that some of the longest hitters are also the biggest jumpers. The average tour player can jump somewhere between 20″ – 22″ vertically. If you can jump over 20″ you can likely generate ball speed over 165mph. We can test vertical jump by simply marking a wall at arms length, then jumping as far as you can over that point. The difference between them is your vertical jump. If you don’t have the ability to check a vertical jump we can also use the broad jump to test for lower body power production. The goal distance for the broad jump is 120% of your height. So if you are 72 inches tall (6 feet) you should be able to jump 86 inches on a broad jump. If you can measure up to these numbers then you have the potential to create incredible vertical thrust forces. A higher vertical thrust helps better players create a positive attack angle which allows them to maintain a lower spin rate which optimizes the physics of the projectile, and that’s what makes the ball go farther. Ground reaction force is any equal and opposite reaction of you pushing into the ground which goes back into the golfer. As you begin the downswing transition, because the feet don’t go anywhere – we get a force coming from the ground that goes back through the body which is followed by a thrust up, which is what allows you to steal energy from the ground, transfer it into your lower body, then the trunk, arm, club and into the golf ball. (the object of destruction). The best players in the world harness that vertical thrust power into rotary power. The main reason the squat is so key to developing vertical thrust power is it has the same general motor pattern. A loaded squat is simply a slowed down jump. Creating an explosive ground reaction force will shallow out the driver, create a positive attack angle, gets the power starting in the lower body so it can be transferred through the core, and then the arms. And that is how you hit the ball a long way! Let’s get jumping!